A short cascade/free fall turns into a slide which veers left before ending in a small, shallow pool. It's in an intimate setting, so photographing it can be a challenge. From the intersection of US Hwy 276 and 64 and NC Hwy 280 in Brevard, follow US 276 North (there are signs for Pisgah National Forest) for 5.2 miles. Turn left onto FR 475 (there are signs for the Pisgah Center for Wildlife Education). 4.1 miles ahead on the left is gravel FR 5095 (Searcy Creek Road); there is just enough room to park here. 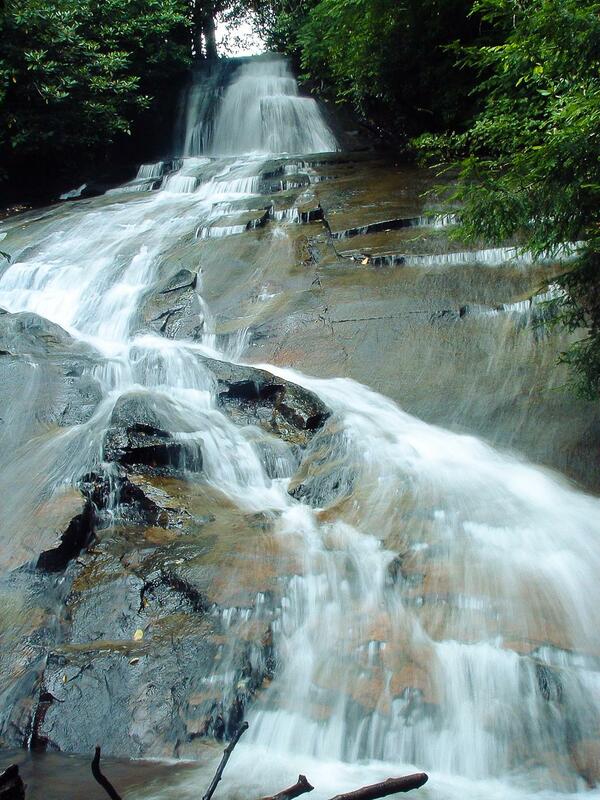 (You will pass the Pisgah Center and fish hatchery at 1.4 miles, and the road turns to gravel at the parking for Cove Creek Falls, and the parking for Daniel Ridge Falls is at 3.9 miles). Hike the logging road less than a mile to the creek crossing; the waterfall is located just a short distance upstream (you can barely see it if you squint). However, even though the hike is easy, getting to the base is surprisingly difficult - you have to climb up through a nasty rhododendron tangle from the road.